Former world junior welterweight champion Amir Khan 33-4 (20) is insisting on a fight with Manny Pacquiao 60-7-2 (39) ahead of a domestic showdown with local rival Kell Brook 37-2 (26) after surviving an early knockdown to defeat a determined Samuel Vargas 29-4-2 (14) on points at Arena Birmingham in Birmingham, England on Saturday night. The 31-year-old from Bolton has Vargas on the deck in the second frame, but the gutsy visitor returned the favour with a right hand bomb seconds before the bell to end the round. 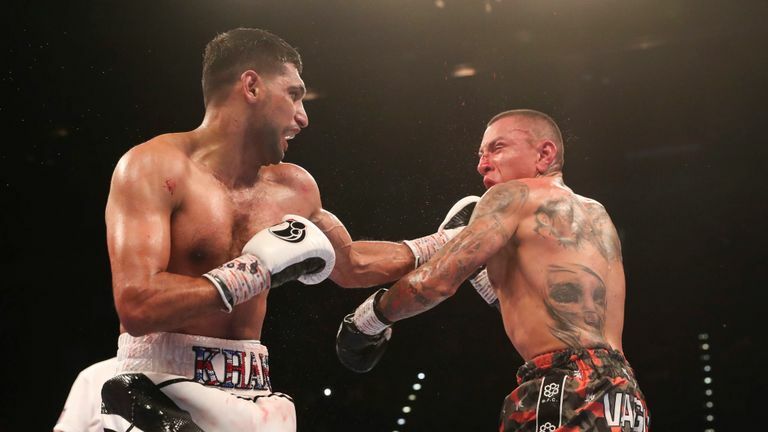 Khan had Vargas on the canvas again in the third but had to endure a strong finish from the Colombian-born, Toronto-based brawler to win on points by scores of 119-108, 119-109 and 118-110. It was Khan’s second fight back after getting knocked out cold in six rounds by middleweight Saul ‘Canelo’ Alvarez 49-1-2 (34) in a 155-pound catchweight bout in May 2016. His last fight, a 39 second blowout of overmatched Phil Lo Greco in April, did little to prove how much he has left in the tank. Former eight-division world champion Pacquiao rebounded from his shock loss to Australia’s Jeff Horn last year with a seventh round technical knockout of faded Argentinean Lucas Matthysse 39-5 (36) in Kuala Lumpur, Malaysia in July to claim the WBA ‘regular’ welterweight title. Promoter Eddie Hearn, who looks after both Khan and Brook, said the fight between the domestic rivals has to happen next or it never will. The 32-year-old Brook rebounded from back-to-back stoppage losses to unified middleweight champion Gennady Golovkin and IBF welterweight champion Errol Spence Jr to knockout former fringe contender Siarhei Rabchanka 29-3 (22) in two rounds in Sheffield last March.